The Old South is visually alive and well at River Plantation Country Club, complete with moss-covered oaks, magnolias, dogwoods and azaleas. Featuring three nine-hole layouts -- Augusta, Biloxi and Charleston -- all with Tiff Sport Bermuda tees and Tiff Eagle Bermuda greens, as well as Bermuda roughs. The 18-hole Biloxi/Charleston at River Plantation Country Club in Conroe, TX is a private golf course that opened in 1968. Designed by Jay Riviere, Biloxi/Charleston at River Plantation Country Club measures 6515 yards from the longest tees and has a slope rating of 121 and a 70. The 18-hole Charleston/Augusta at River Plantation Country Club in Conroe, TX is a private golf course that opened in 1968. Designed by Jay Riviere, Charleston/Augusta at River Plantation Country Club measures 6533 yards from the longest tees and has a slope rating of 121 and a 70. 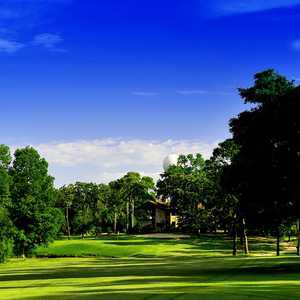 The Conroe CC is an old, traditional 9-hole course with tree-lined fairways and tiny greens. Majestic oaks and the original two-story frame clubhouse add character to the track, which originally opened as the San Jacinto Country Club back in 1935 to provide recreation for residents who were making good money in the oil business. Located just north of the Woodlands, Panorama Golf Club (formerly known as The Village Golf Club) boasts some of the most interesting layouts in the greater Houston area. The club offers three different nine-hole courses: Rolling Hills, Winged Foot, and Thunderbird; that each have a unique design and feel. The Rolling Hills course is considered the most scenic of the three and it's the second longest after the Winged Foot nine at 3,426 yards. Panorama Golf Club (formerly known as The Village Golf Club) in Conroe offers three nine-hole courses: Thunderbird, Winged Foot, and Rolling Hills. Each nine has a unique character which has given the club the reputation of having some of the most interesting layouts in the greater Houston area. The Thunderbird course is the shortest of the three at just over 3,306 yards from the back tees but it's still a fair test for golfers of any skill level. 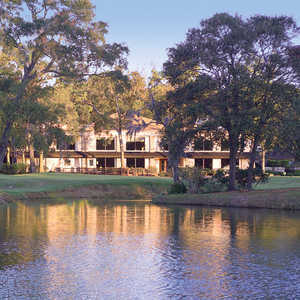 The 18-hole West Fork Golf & Country Club in Conroe, TX is a public golf course that opened in 2004. West Fork Golf & Country Club measures 6908 yards from the longest tees and has a slope rating of 135 and a 73.1 USGA rating. The course features 4 sets of tees for different skill levels. There are 27 holes of golf available at Panorama Golf Club (formerly known as the Village Golf Club) in Conroe, just north of the Woodlands. 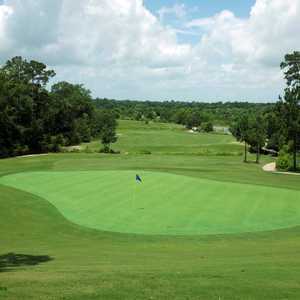 Divided into three nine-hole courses, each layout offers a unique round that is enjoyable for all skill levels, allowing the course to boast having some of the best layouts in the greater Houston area. The Winged Foot course is the longest of the three at 3,443 yards from the back tees.